The Belmond Andean Explorer Train is an unparalleled South American travel experience that brings together the spirit of adventure and indulgent luxury travel in Peru. It also happens to be the first and only luxury sleeper train in South America. 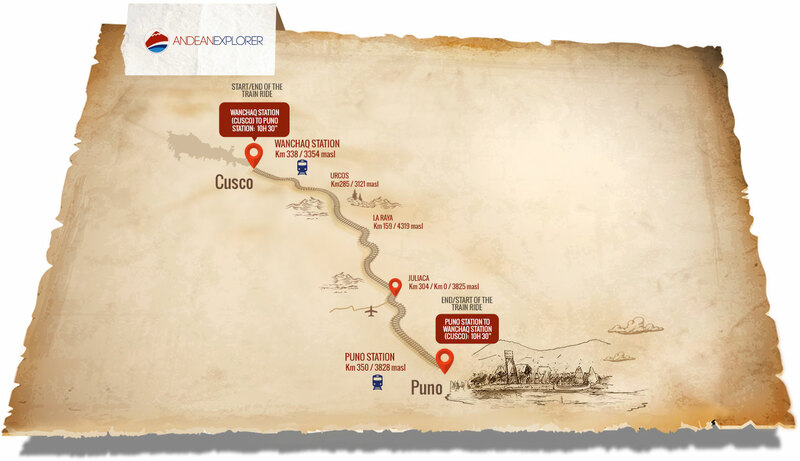 Their one- and two-night train journeys to Cusco, Puno, and Arequipa deliver you to the doorstep of some of southern Peru’s most popular tourist attractions. The train’s luxurious interiors and exceptional amenities make for both a comfortable front row seat to Peru’s stunning Andean and altiplano landscapes and a restorative haven to refresh and unwind after an exciting off-board adventure to sites like the Colca Canyon, Lake Titicaca, and Machu Picchu. The Andean Explorer Train includes all of the luxuries of its sister train, the award-winning Hiram Bingham Train, with the added amenity of an inviting en-suite cabin to call your own. All of your meals are served in the elegant 1920’s-style dining carriages where skilled chefs from Cusco’s Belmond Hotel Monasterio prepare for you fresh, locally-sourced, and seasonal cuisine. This luxury train service offers travelers an unforgettable travel experience with personalized service that takes care of every detail for you. Contact us today and get your free Peru trip quote. At Kuoda Travel, all trips are custom and personally designed for you by one of our professional travel experts.